Alder and poplar are the safest wood options to use in traditional, near infrared, or far infrared saunas. 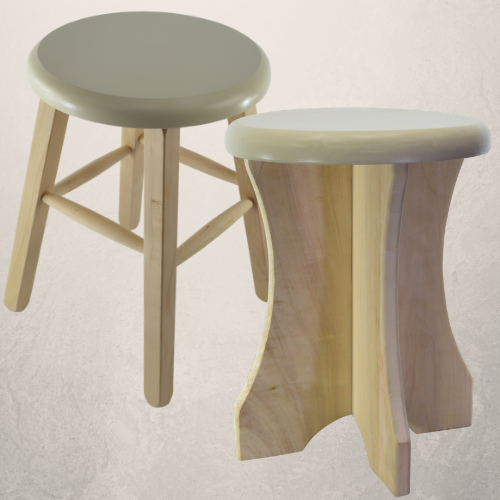 The Poplar sauna stool made of natural untreated poplar and the Alder stool entirely made of alder wood and coated with 100% non-toxic milk paint are both high quality and are easily assembled. Although created specifically for Sauna Fix near infrared saunas, they can as well provide comfortable seating with other sauna types. Poplar does not contain or emit phenols, and the milk paint used on Alder stools seals and protects the surface from sweat and moisture. These stools are made in America with imported and domestic materials and will make an excellent compliment to the non-toxic sauna radiant tent, which will let you enjoy your sauna therapy to the fullest. They do not require to be disassembled after a sauna session or put back in the bag or box. They come in a sleek and lightweight design but are also sturdy enough to be used inside a bath tub or shower if that's where you hang your near infrared sauna lamp.